This past week our family experienced a devastating blow, feeling betrayed and misunderstood by someone who should have been a trusted friend. I don’t know if it was viciousness or ignorance on their part, but they will never know the damage they have caused. I’d like to think what they did was out of love but it only feels hurtful. I have lost trust in just about everybody and feel a need to rebuild all relationships. I’ve been challenged on something that I hold most dear. Like something that stabbed me to the very core of my purpose. What I’ve learned: Be careful what you say and who you trust, and believe me, I thought I was already a cautious person with whom I trusted my heart and my family’s challenges. What I haven’t learned yet: how to forgive and move on. This burden feels heavy. I am trying to replace this suffocating fear with faith and trust in a loving God who will watch over us, and replace all pain with exquisite joy someday. 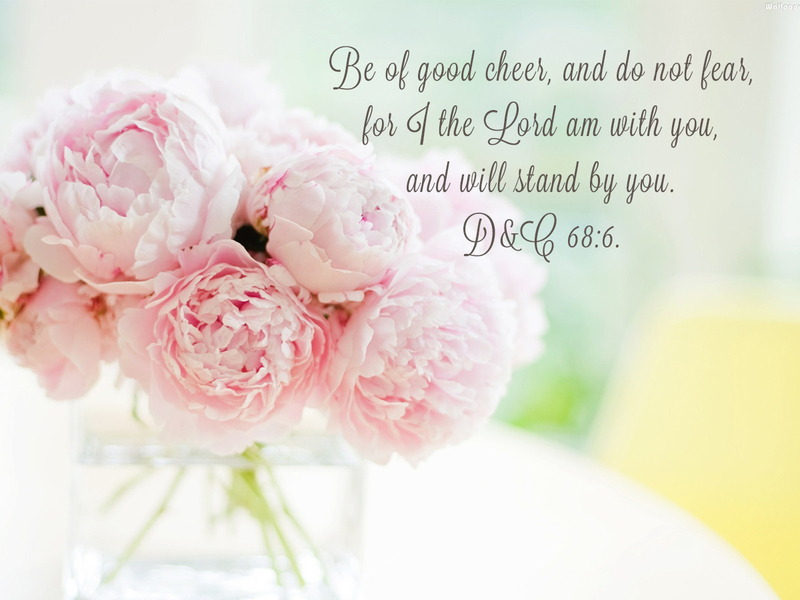 My faith tells me that even when I feel abandoned by mortal friends, my Savior and Redeemer stands by me. I feel deeply that God is aware of me and my family, our desires, our efforts and all is acceptable to Him. He knows my struggles, my weaknesses, my heartache, and He offers me strength and comfort. Sunday was a painful day. It was so hard to go to church especially when Jimmy had to leave my side to go to Elders Quorum, but because I know my issues are not with God, I knew I needed to humble myself and attend so that I could participate in a sacred sacrament ordinance and feel of the Holy Spirit. I wish I could say my heart was where it should have been, but it was still hurting and doubting others motives. But attending Seminary Graduation Sunday evening was a healing balm. Hannah played the piano and the closing hymn, As we Search the Holy Scriptures, resounded with my soul. 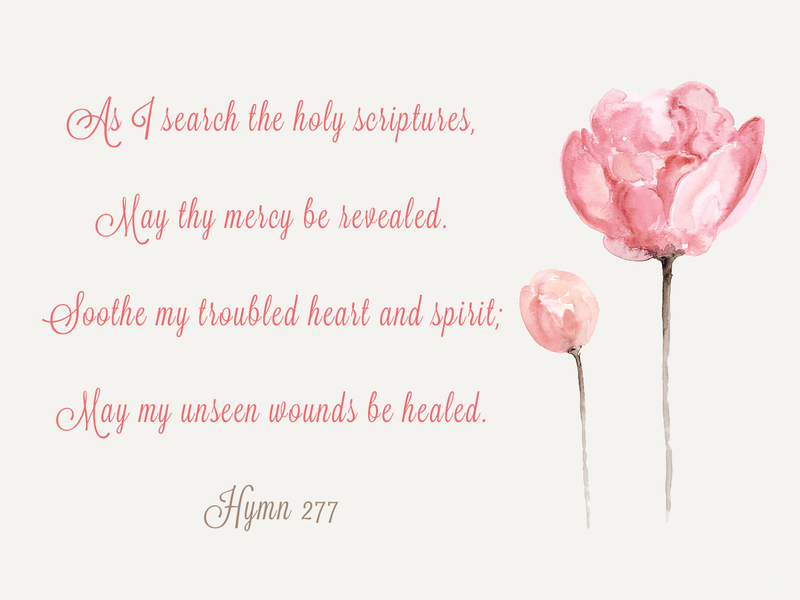 One way to allow God to heal our souls is to partake of His Holy Word. 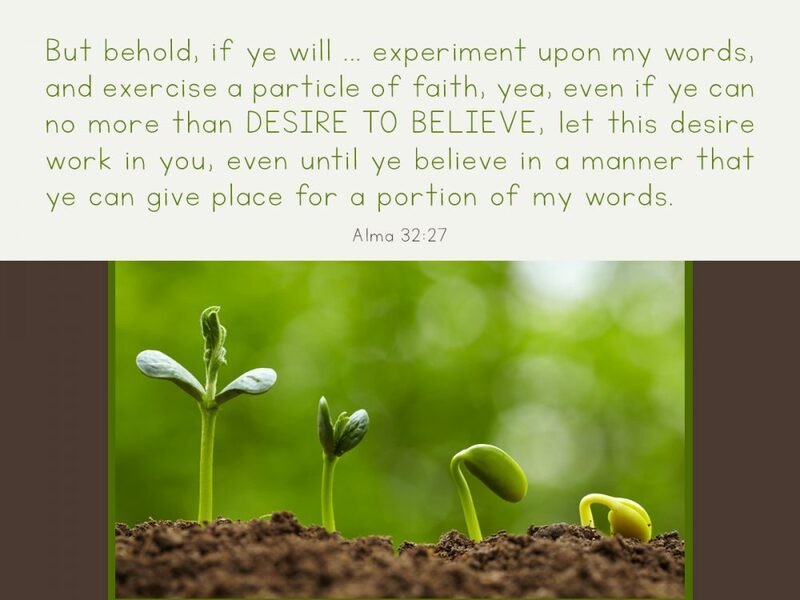 A study of the scriptures allows us see miracles and blessings that came to those who remained faithful. As for unseen wounds that need healing… I know we all have hurts that need God’s mending power. When I have challenges that I cannot share with others, the burden seems heavier. I am used to calling husband, mother, father, sisters, friends to receive advice and comfort. And although God has sent these angels to help us along the way, there comes a time when there is nobody to rely on for strength but our Heavenly Father. I know the greatest healing and comfort comes in humble prayer to a loving Father. But do I feel connected to Him? I do not want bitterness to eat away at my soul. I visualize the canker and ugliness that bitterness creates inside of me. And then I try to visualize a pure love cleansing my heart to occupy that space. I find this might take time but I have a “desire to believe” in this “change of heart”. This week I’ve listened to several talks on the power of forgiving others. 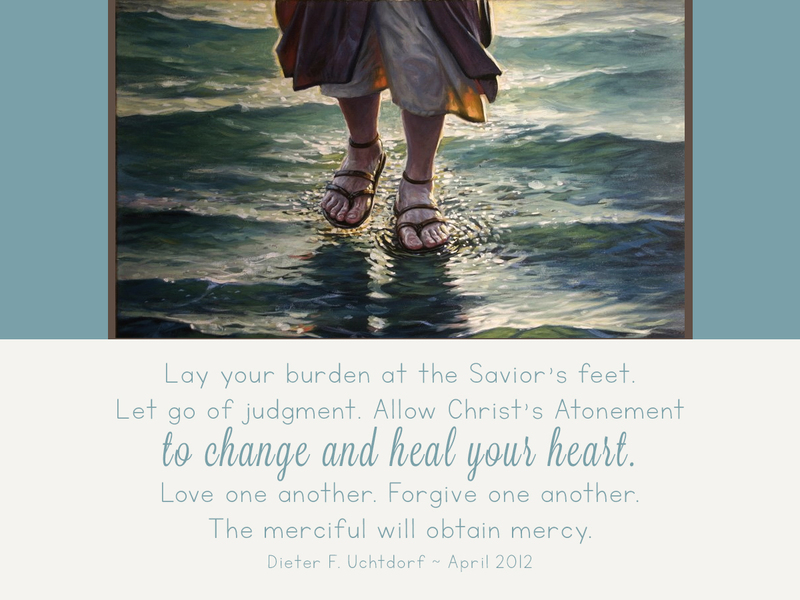 My favorite was by Dieter F. Uchtdorf from 2012 called The merciful obtain Mercy. 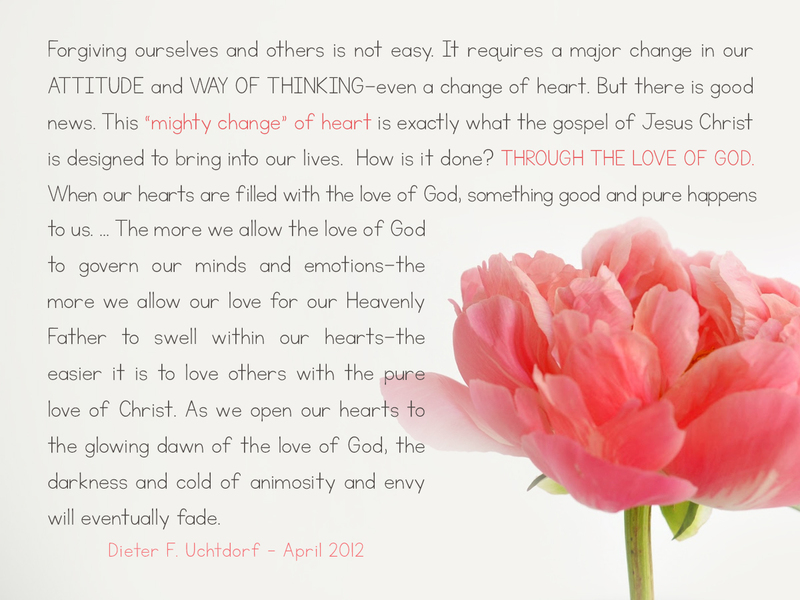 The following quote emphasizes to me that the Love of God is what dispels fear and anger and hurt. When we are filled with God’s love, we see others and ourselves as He sees us. His emphasis on changing our thoughts and attitude remind me that I must keep my thoughts emotionally healthy. Blaming someone or acting the victim WILL NOT BRING PEACE OR HEALING! But healing will come as I continue in God’s Love and allowing thoughts of TRUTH and PURITY to fill my mind and heart. 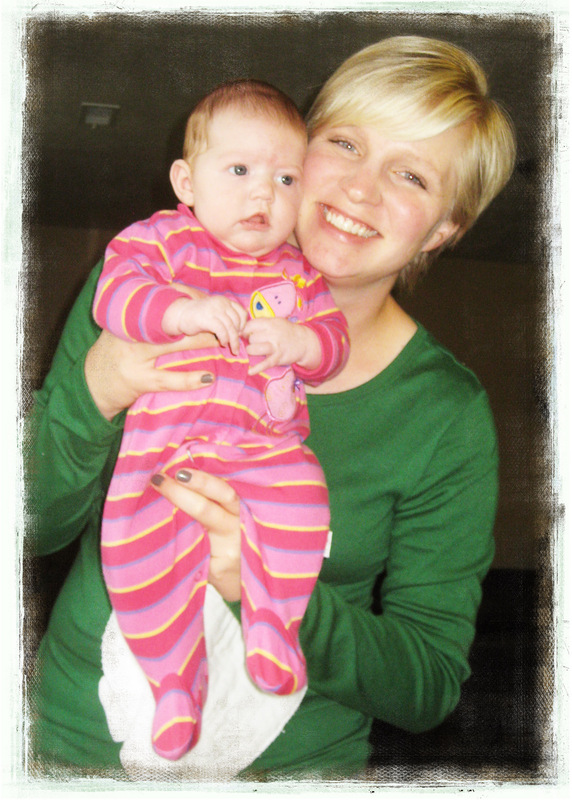 Believing in my AMAZING DIVINE NATURE and WORTH will help me fight feelings of discouragement and failure as a mother. Show the naysayers that I am Strong in Christ. That my foundation is firm. And I will persist in acting on all the good I am capable of instead of hiding under a rock (which is what I feel like doing most of the time in public. Much anxiety about my mothering and my children’s behavior? ummm, yes). Sometimes I don’t know what to do with these heavy burdens. My friend Julie has helped me visualize it like this. Take all your worries, your schedule, your action items, your responsibilities and lay them all down on an altar. My prayer would be something like this, “Loving Heavenly Father, I cannot carry all of this right now. Please take all of it and make something better than I can out of it all. Help me know which items I should pick back up to move onward with together with Thee. What can I do without so as to simplify my life? 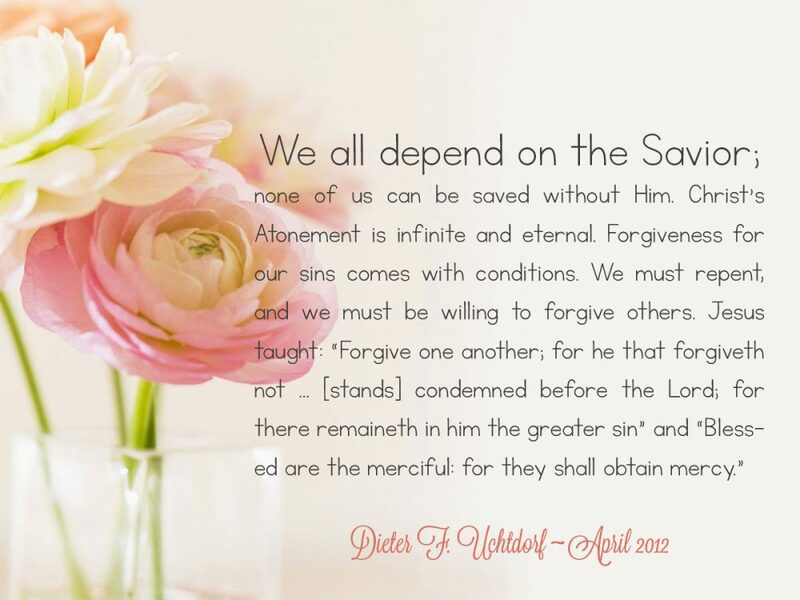 What burdens can I hand to you and to a perfect Savior who has saved us not only from an eternal death, but has also carried our burdens so that we don’t have to? Please take away the pain and replace it with LOVE and peace.” Something like that. That visualization helps me see this principle of handing burdens over to God more clearly. Next, this next quote is also a reminder that because of God’s mercy towards us, we will be like Him as we offer forgiveness and love to those who offend us and because of God’s truth in that principle, healing occurs. I’m writing this entry in bursts as that is the only way I can function with 6 kiddos and a mom brain. Everything is probably a bit disconnected. Welcome to Heather’s Brain! 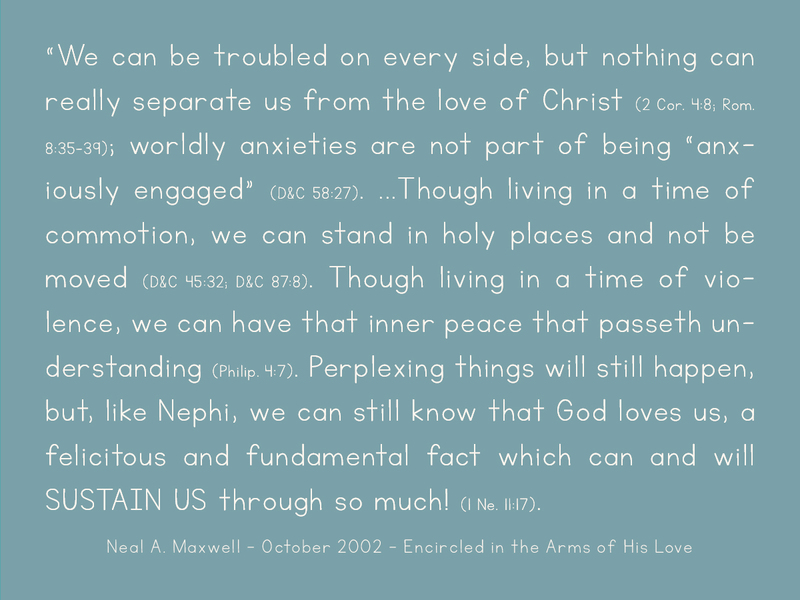 So after writing much of what’s above, I listened to a great talk: Encircled in the arms of His love – Neal A. Maxwell. Well, since it’s Elder Maxwell, really I read it first, then listened to it, and then read it again to catch the parts my HEART needed in this healing time. 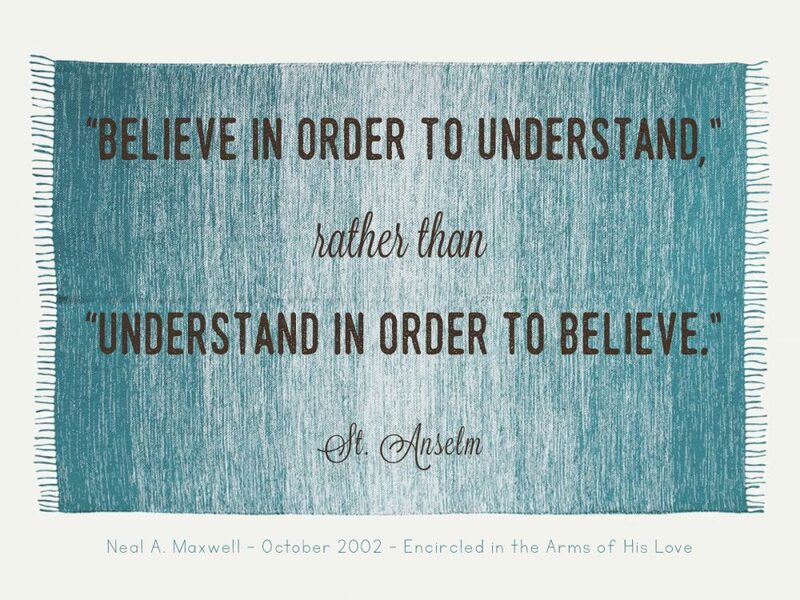 First we must believe before we will ever understand… Believing that God loves us and will allow challenges stemming from other’s using their agency poorly, needs to come before the light of understanding. We may not understand or see the strengthening that is occurring or how this experience is preparing us to serve and love someone else. Perhaps we may eventually understand and see the lessons we needed to learn. 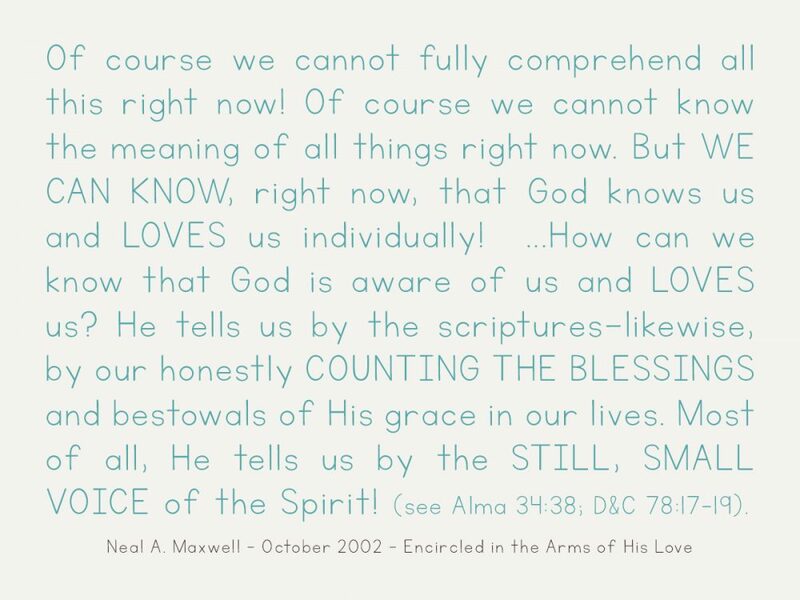 And even if that ‘Understanding’ only comes after this mortality, we can always know and maintain a knowledge of God’s love for us! This following quote reminds me that truth always receives “2 or 3 witnesses”. As mentioned in the hymn earlier, the scriptures teach us of God’s LOVE for his people. And that we can feel of God’s love by choosing to see the blessings and mercies he has shared with (HEART ROCKS!!!). And lastly that we feel of God’s love through the Holy Spirit. 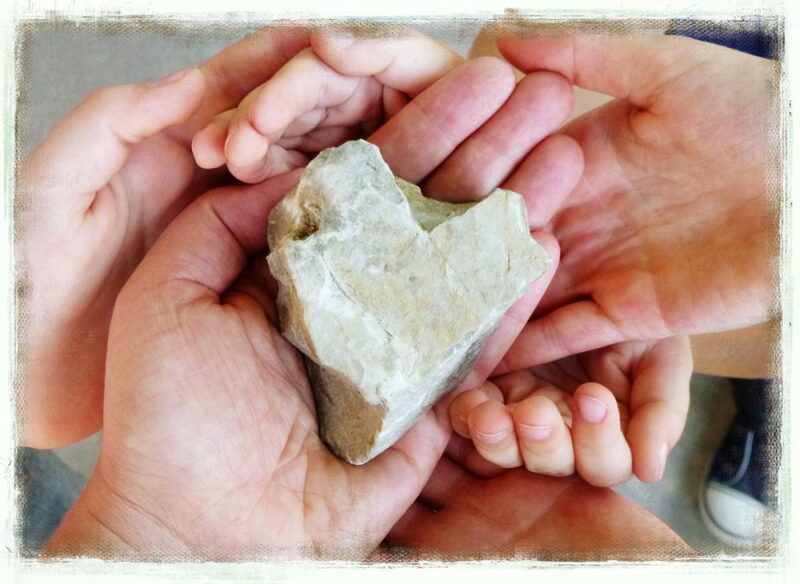 A reminder of how important it is to have this beautiful feeling in our hearts and home and family. Final thought by Elder Maxwell. I think of Stephanie and our “Tie on your bonnet Sister for WE WILL MAKE IT TO ZION!” message I’ve loved for all these years. 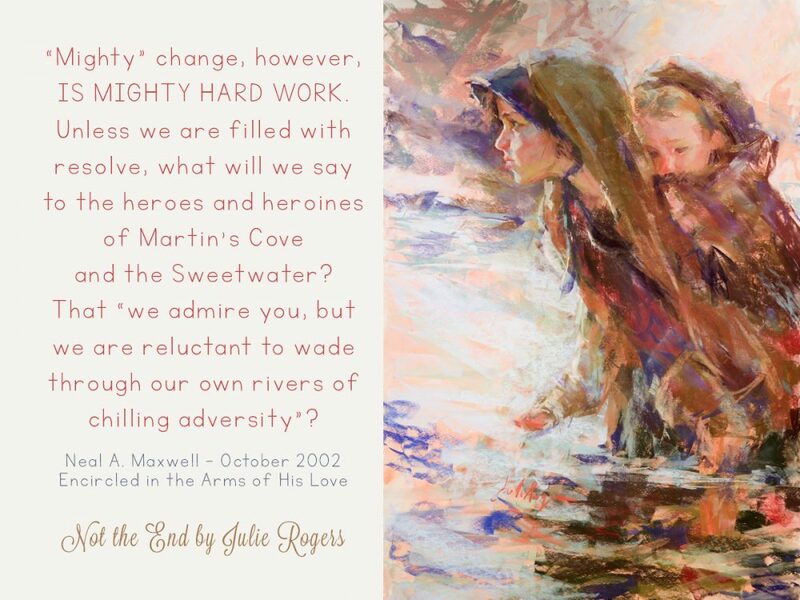 Changing our hearts and desires and feelings might be mighty hard work. But those who came before showed the endurance and faith that I need now in my challenging situation. Why should we mourn or think our lot is hard? ‘Tis not so; all is right. If we now shun the fight? Gird up your loins; fresh courage take. And now I’ve come to the end of my thoughts for a period. The past few weeks I’ve gone between anger and sorrow and judgment and pain with bits of healing in between. Gathering and writing down these thoughts has helped me heal immensely. God’s loving word through prophets and his Holy Word in scripture brings much peace. And even though I needed to be vague about details in regards to this specific situation, I feel that these principles are understood by many in various challenges. I wanted to note them to bring remembrance to my future self or family. Plus, healing and joy come to me when I am creative… hence all my cutesy-poo quotes I always do as a visual learner! Outside my window… Bright Texas Sunshine. 62 degrees which is perfect! Falling Leaves. I am thinking… about how to help our family be more peaceful and happy together. We’ve had so much arguing and nit-picking lately with all the kids. It seems someone is always crying, or arguing, or fussing or having to do push-ups as a consequence. We need each other. Our family is all we have for eternity (well, and God!). I really am praying we can figure out how to have a better spirit in our home and help those children with mega issues to be more peaceable. I am wondering… how in the world I’ll go a month without sugar. I decided to do it on Monday. And yesterday I didn’t have any treats or sweets or chocolate. That is huge! I have to improve my health on 2-3 points or my insurance is kicking me out of the ‘wellness health discount” or whatever it is. $150 more each month is way too much on insurance premiums so I’m kicking it into high gear. Plus, who decides to potty train a Scotty and go without sugar on the same week. Crazy mom! I am Praying: for the way to a new treadmill. So silly. But i keep hoping I’ll either win one on a give-a-way… or more eternally beneficial and principled to find the pennies to save (on top of my idaho vacation fund) to buy one. We had one for 12 years that I tried to use but was never very consistent … but it died last year. But I’ve just got to commit to exercising 6 days a week and in Texas heat and humidity, indoor exercise is how it has to be, unfortunately. But I know if I exercise, it will encourage me to eat healthy… And vice-versa. Anyhoo… so tricky to balance health and exercise as a mom of many. Jimmy… He works tirelessly for our family. At work and at home. Scotty… He is quite the character that keeps us laughing when he’s feeling jolly. Eiza… Lately she’s been a good friend to me. She’ll rub my back and enjoy talking with me. Truman… So grateful on days when Truman gets up and gets going off to school with a happy heart. Max… has so much faith! Grateful for his natural testimony. 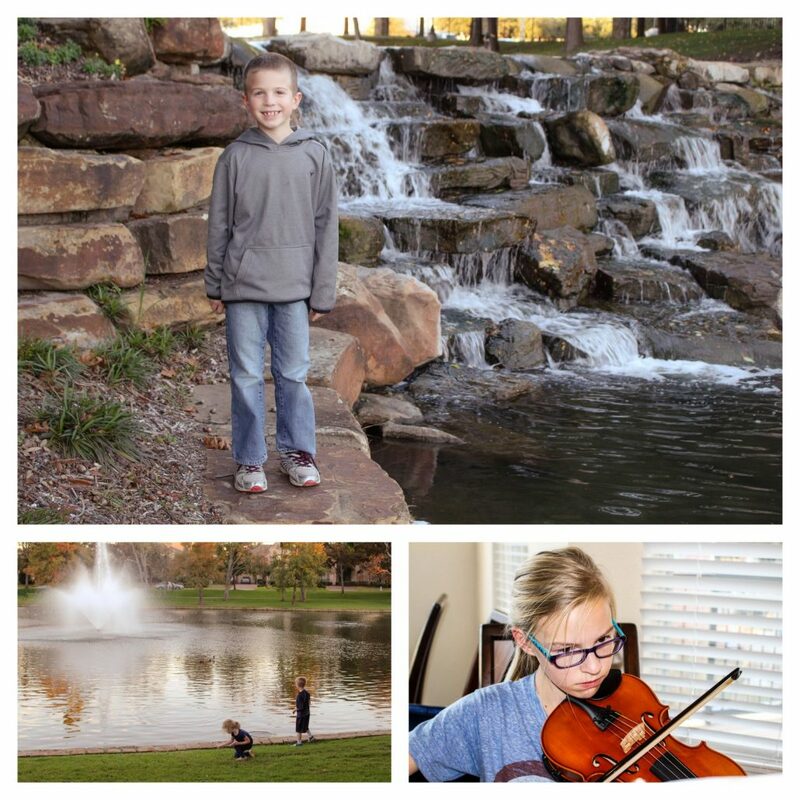 Abe… working hard and accomplishing good things in honors band trumpet. He came in 3rd chair for district trumpet out of all the middle schools. Hannah…. this girlie gets up early for seminary and is mastering the “I can do hard things” life with so much going on with homework, friends, driver’s ed. And she is a dear heart at home for all. I am lovin’: SLEEP! seriously love a good’s night’s sleep. Love my cozy blanket on my bed right now. Love taking a respite from the stress of life. Sleep … it does a mama’s emotions good! Hannah: Christmas Music. Playing the Organ. Patience with friends and life circumstances. Abraham: How to build a boomerang out of paint sticks in Engineering. Maxwell: Spelling Bee on Monday! Go Max! Truman: a need for fidget toys to help with focus. Learned to whistle. Eliza: Just learned to ride a bike without training wheels. Scotty: Learning to go potty. Wahoo! From the kitchen… another batch of Fire Cider. Hannah made sweet potato, black bean, corn Flautas. Pretty yummy & healthy. Little kids didn’t agree and there were tears all over the place. I am wearing… my favorite t-shirt cardigan (hand-me-down from Mary), Old Navy California bear shirt, Jeans (with a new hole in the knee. arg! ), Pink nike shoes that are not comfortable. And since I actually got ready today I’m going to comment that I’m wearing mascara and lipstick. bonus! I am remembering… days when I was just mostly exhausted physically for carrying and helping little ones. Now it’s more emotionally exhausting than physically. Love my kids so much! But wow… balancing life is a tricky business. I am creating… a few scrapbooks for Christmas. I’m not sure how and when I’ll get them done, but I have oodles of free $ to shutterfly that expire in December. Eliza has been begging for a photo album. And Max appreciates them as well. I am reading… I just read the entire Jonquil Brothers books by Sarah Eden. It was so silly to read them all but it was so fun to have my twice-a-year-read-a-thon. I am hearing… Scotty’s tv show. I don’t remember what it’s called. But it’s so hard to watch such a toddler show so poorly made. Ugh. But Scotty likes it. I’m trying to convince him to watch Wreck it Ralph Movie. I think he’d like it. He loves fixing things with tools with Jimmy. But he won’t give it a try. Around the house… Messes. We still haven’t picked up sufficiently from our house guests the past week. Toys scattered about. So often I ask the kids to each put away 25 or 50 or even 100 things just to get things tidied up better. Crazy that we even have that many things. Which brings me to the discussion of getting rid of much of our stuff. Gotta sort through and figure out how to do that. 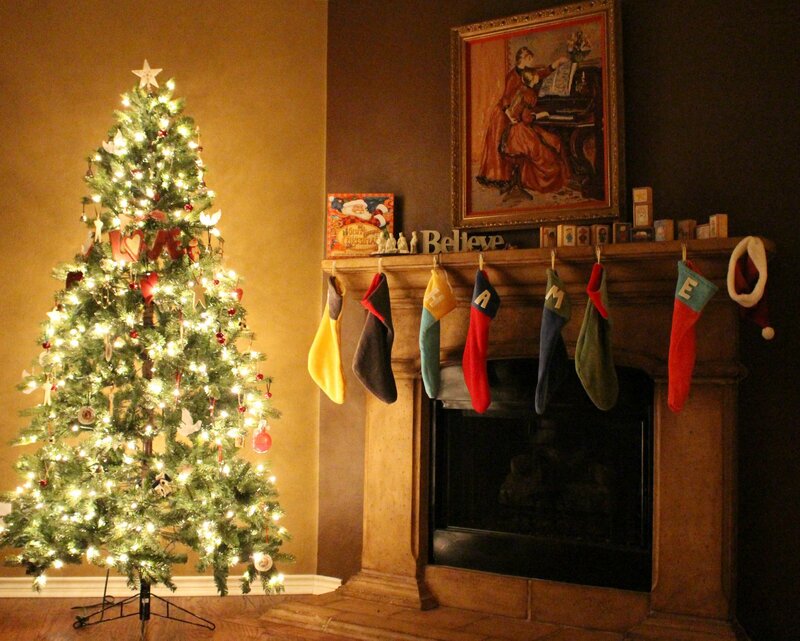 BUT … we have the Christmas tree up and even though it’s not decorated yet, the #ChristmasLight is awesome! 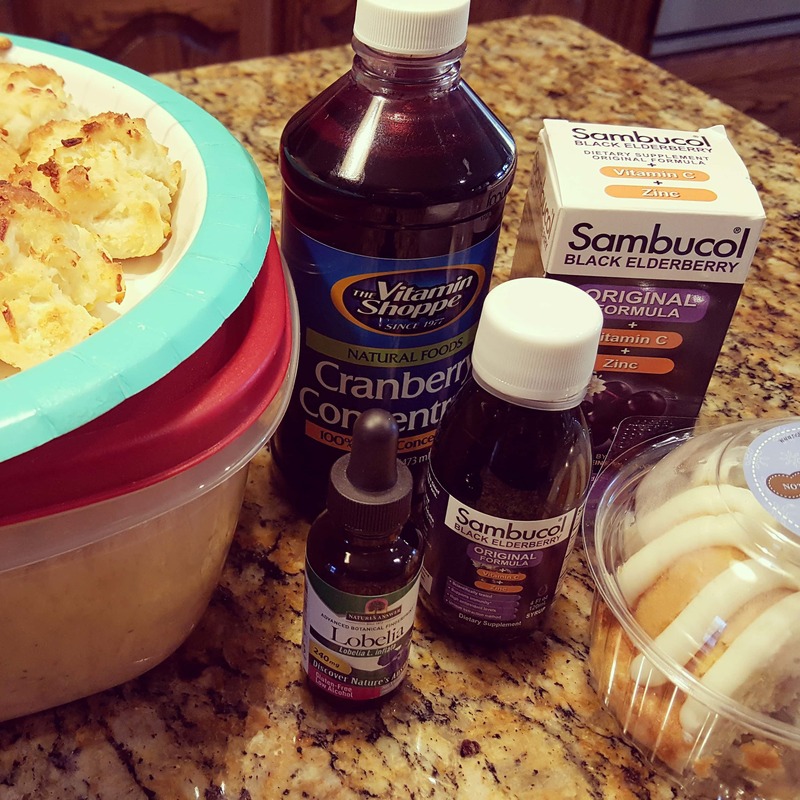 One of my favorite things… Apple Cider Vinegar. Ewwww. Not my tastiest thing but a healthy thing. But it ought to be noted that I honestly think it has helped my immune system. The only time I’ve been really sick in the past 6 months was the week I stopped taking it. I honestly think it’s disgusting, though cayenne pepper helps cover the taste. I put a tsp or Tblsp in a glass of water and drink it as fast as I can. Then I drink another cup of plain water to help wash it down. A few plans for the weekend: Stake Conference. A scripture I like: Philippians 4: 8 “Finally, brethren, whatsoever things are true, whatsoever things are honest, whatsoever things are just, whatsoever things are pure, whatsoever things are lovely, whatsoever things are of good report; if there be any virtue, and if there be any praise, think on these things.” I heard this the other day and it was a good reminder to keep thoughts positive and to focus on the good in our life. Of course there are hard things. Of course there are occasional doubts. But there is faith and hope and light and goodness to fill our hearts and minds with. I just really loved my hair short. Even though it made my neck look like a football player’s… and my family didn’t love it as much as I did, it was just a fun haircut for that time of my life when little Eliza was a wee babe. Plus, I remember I loved green that year. Color of the year probably! Plus, newborns! So much snuggles and baby smiles and smells. Plus, I was skinnier then. So funny that’s my new goal is to look like I did after baby #5. Yikes! Baby Steps. Last fall, we got Six Flags season passes, good through the end of 2017, for Hannah, Abe, Max, and myself. Every once in a while, season pass holders are allowed to bring a friend for free and that day came last week. So me and Max brought Eliza and Truman as our friends. All three kids were very excited to go. It was great motivation. 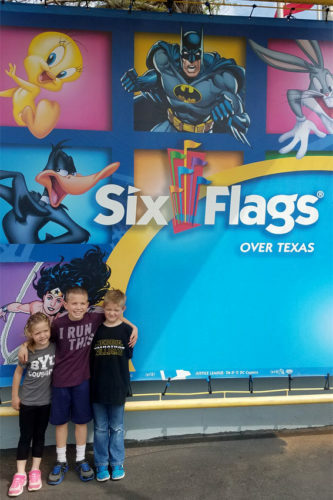 They rarely have done their chores and homework so well as when they were told they could only go to Six Flags if they got it done. 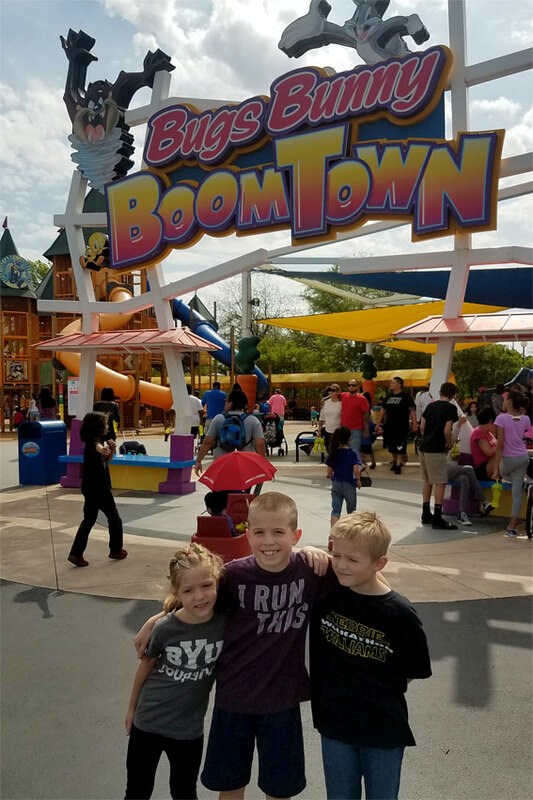 :) Here are Eliza, Max, and Truman near the entrance to the theme park. While Truman doesn’t look very happy in this or many other of the pictures, he really was very good and very happy throughout the day. He just doesn’t know how to fake a smile, thus when he is told to smile for a picture, it never comes off as natural. The first ride we went on was the Tea Cups. 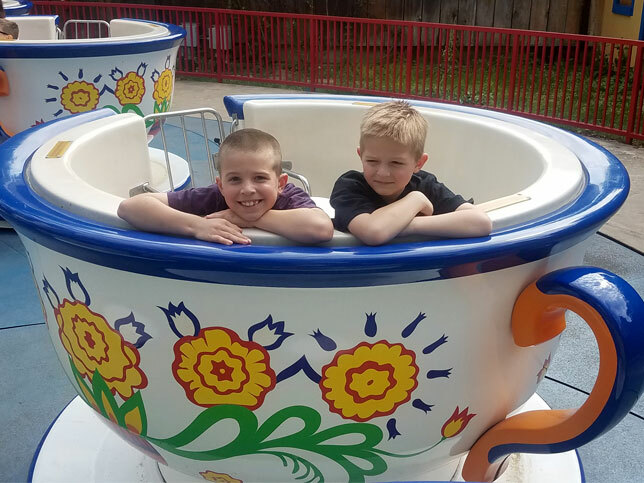 Eliza was in a tea cup with me, Daddy, and Max and Truman were in the tea cup next door. All the kids loved it. We did the ride two or three times. We next went on the Sombrero ride. Eliza opted out of this one. 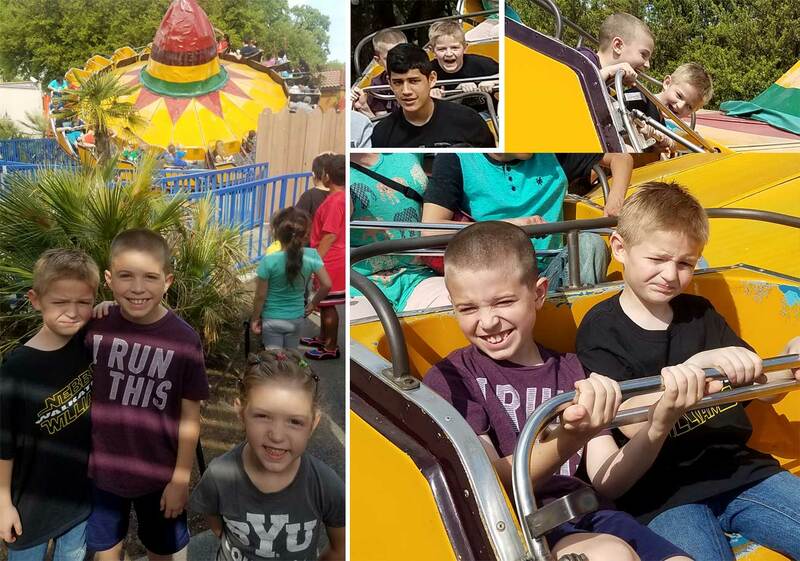 This gave me the opportunity to snap some good pictures of Truman and Max while on the ride. When he’s not posing, you can see the natural joy and excitement on Truman’s face. 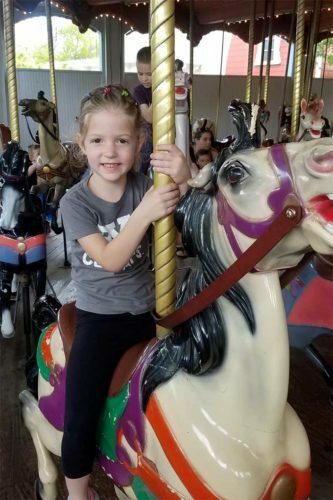 We next visited the Carousel per Eliza’s request. She loved it. Next, we headed to Bugs Bunny Boom Town, a collection of about a dozen kiddy rides all together in close proximity. 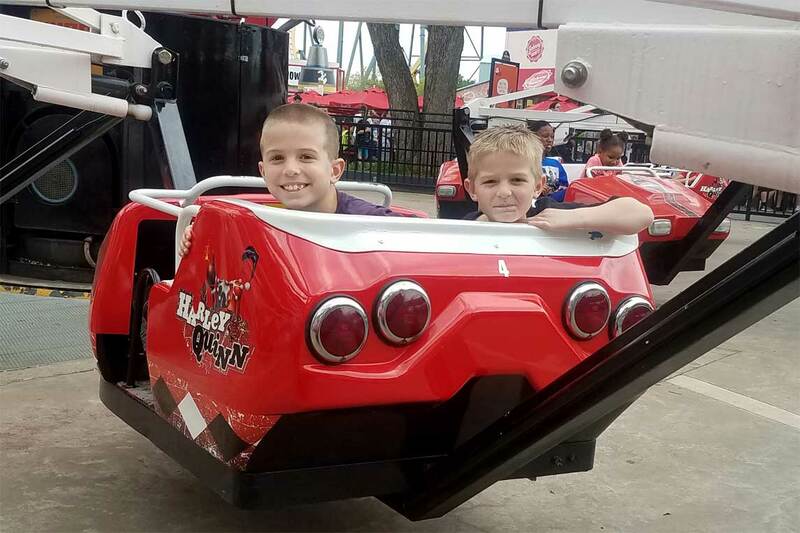 We rode the Marvin the Martian Space Ship ride. While in line for this line, we were standing by some kids who were soaking wet. 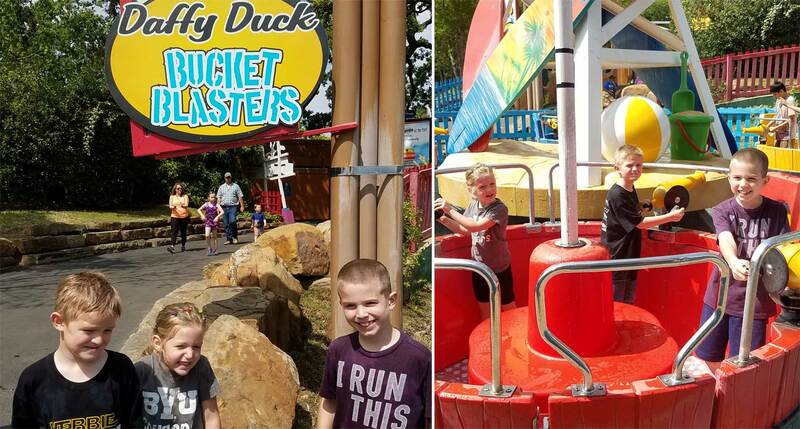 They said they got wet on the Daffy Duck Bucket Blasters ride, and Truman insisted that we go there next. 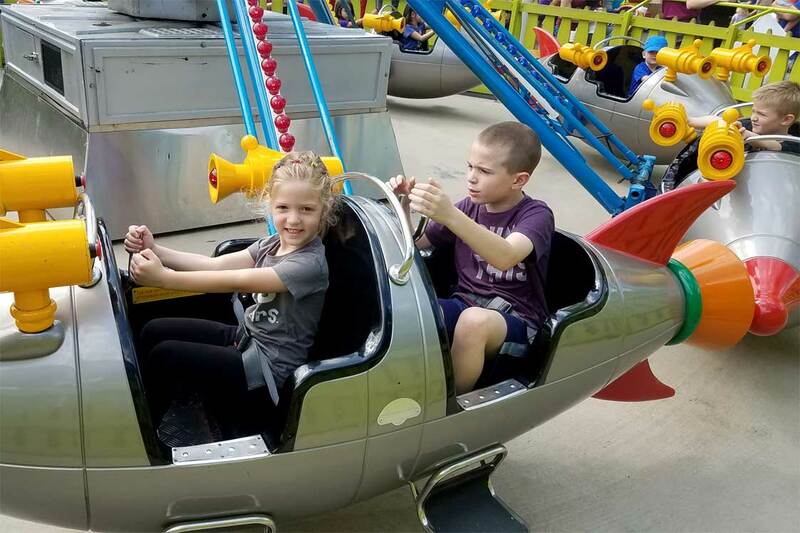 Truman said the Daffy Duck Bucket Blasters was his favorite ride. Of course, I think at one point or another he said almost all the rides were his favorite. The last ride I have a picture of is the Harley Quinn Spin Cycle. This was the only non-kiddy ride we did all day. Eliza wasn’t planning to ride it, but when we got to the front of the line with Max and Truman, she decided to go. And she loved it, as did Truman and Maxwell. Not pictured, but on our way out of the park we also did the Bat Wings ride, which Eliza really liked. And we stopped by the giant play ground in Bugs Bunny Boom Town, and the kids loved that. After three or four hours the park started getting really crowded and the kids were getting really tired, so we headed for the exit. Overall, it was a great day. It’s been forever. Life is hectic. I can’t fit in everything I’d like to do. We went on a 10-day trip to Utah. It was hard. It was fun. I was just going through pictures and was able to auto-merge these photos we took into a panoramic version. Cool, eh? You can even see the fire in the distance on the left side. If we would have gone to the south rim, that fire would have smoked the entire view (as it did in 2001-ish when we went there). So, I’m super glad we went to the North Rim. 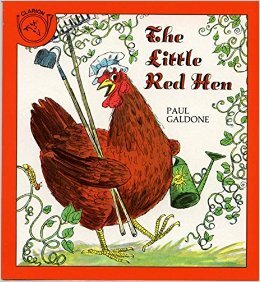 which was a perfect lead-in idea to read The Little Red Hen for a Family Devotional. 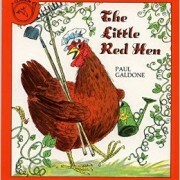 Ah-ha… interesting how often we sound like the ones who didn’t want to help that hard-working little red hen. 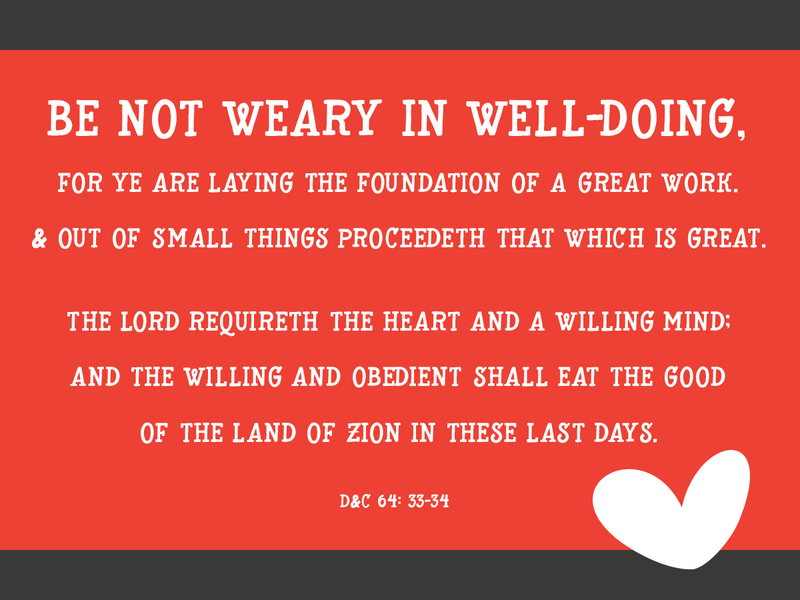 Jimmy shared the scripture in Galatians & D&C about not being weary in doing good for others. I came across this parenting article which I quite liked for our family…. Of course in the story, losing out on cake is just the trick needed to get her lazy, and now hungry, crew to start pitching in – presumably living cooperatively ever after. 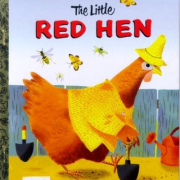 Especially when children are young, this deceptively simple story has some wonderful lessons to offer including messages about working together, planning ahead, standing up for yourself, and the power of consequences. But, not all of the morals of this story are for children. Many parents fall into the trap of doing most of the work while their children spend their time lounging around, playing and socializing, or focusing on their own pursuits. In fact this dynamic is one of the core power struggles in countless families – who’s responsible for the work and who’s responsible for the leisure. When my children were little, we came up with a phrase that worked well to address this dilemma. We called it Fun & Done as in: Let’s have fun AND get things done, too. Play and clean up. Cook dinner and then relax for a little while. Or better yet, have fun while getting the chores done. I used to read to my kids while they folded the laundry. And while the laundry didn’t exactly disappear, it was a nice way of balancing the need to move the day forward with the equally important goal of engaging in the only opportunity we would ever have to enjoy that particular day. Creating a spirit of family cooperation is the critical element for setting up a scenario where everyone can get better at both having fun AND getting things done. Talking to children about what it takes to keep a household running smoothly is a good segue into getting them on board for pitching in. And of course being ready with those calm consequences is a good idea as well. But the other obstacle to this approach comes from Mama Hen herself who has to shift her expectations and be open to getting less done, putting away her checklists and re-learning what her children (and maybe even her partner) already know – how to relax and enjoy the moment. This can be harder than it sounds. I know many moms who admit that they feel better when they do it themselves because it gets done right. Then there are those who may do a heck of a lot of squawking about not liking this setup but don’t insist that their clan pitch in. And finally there are those who acknowledge that they just don’t get the whole “fun” thing. Maybe it’s because they have forgotten or maybe they have gotten so caught up in their “To Do” lists that they don’t know how to stop planning the fun and start participating in it. 1. 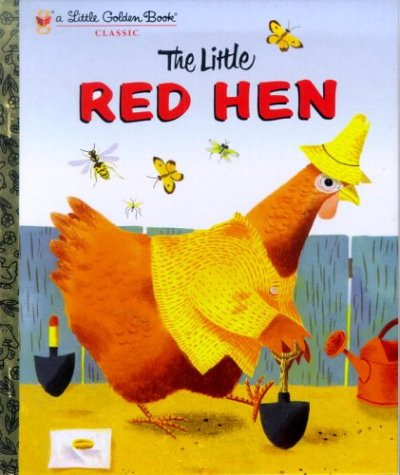 Get the book “The Little Red Hen” and read it to your family. Finding that balance is challenging and fairly unlikely to stay that way for any length of time. But “time” is the crucial word here. Because before you know it, your kids will be gone and you really will be eating that cake alone. Which is too bad because, like chores, cake is so much better (and definitely less fattening) when it is shared. Annie Zirkel, LPC is a parenting consultant and workshop presenter based in Ann Arbor. So … long time no blogging. We were healthy for so long. it ended the week jimmy had a week long meeting in oklahoma. we had the 3 littlest with rsv & strep. And I felt completely strengthened by earthly and spirit angels. Amy Binns brought us treats or food almost every day and had us for tacos the night i took scotty to the e.r. sister jorif helped so much with transportation and being a friend. I knew that other angels were watching over us. i felt their patience and strength. i’ve had the worst flu in my life. i don’t even think i’m exaggerating. and i had to take advil and tylenol every 3 hours. if i waited 4, it was so intense. those laser shooting pains in your muscles. ouch. anyhoo… fever for 4 1/2 days. and then hallelujah… the fever broke sunday night. to a deeper more productive cough with mucous. so now I am just trying to rest and be watchful that i don’t get pneumonia or something. shelly reeves in our ward texted and said she was bringing dinner. and i thanked her and told her we were on the mend. after all we hardly know her and I felt bad for her to spend time on us. alrighty then. I’ll gratefully accept. and today, i was so grateful. jimmy came home early yesterday but today he had a later meeting. i didn’t get down for a rest until almost 3.
amy binns picked up the boys from school and took liza and max so i could rest. and shelly brought soup and biscuits at 5ish. she told me that she had a dream about my mom a few days ago which was weird because she didn’t know my mom. i told her I’m certain that it was because my mom prays so much for us to be watched over. i know that her inspiration to bring us dinner and share that love came from my mother’s prayers. my mom has the sweetest desires to be able to be with us and help us all which isn’t always feasible when we move so far away. all sorts of tears going on when i was telling shelly this. I told them that this soup was a gift from God and shared the story about the dream and my mom’s prayers and shelly following the Holy Ghost. It’s really hard to talk when you’re crying and you can’t breathe because you already have some major coughing and tight airways going on. so my voice was quiet. but the kids listened. it isn’t always about the soup. 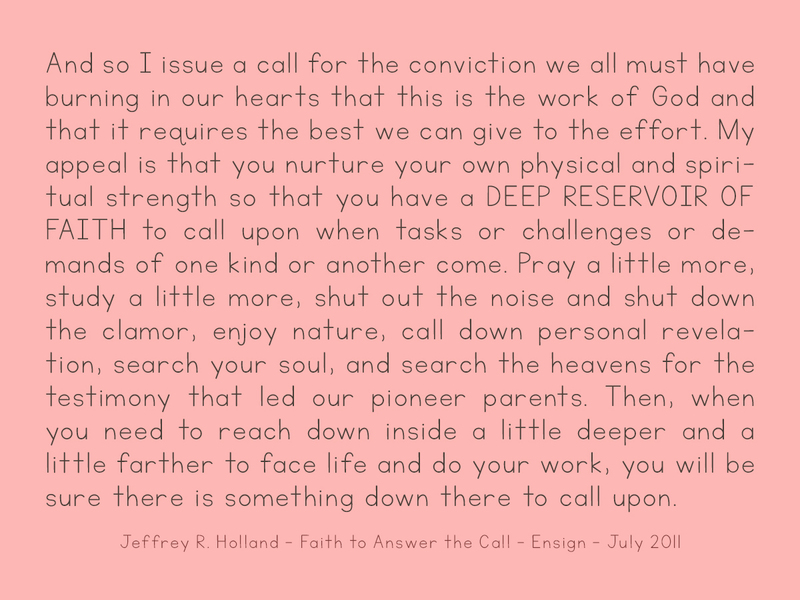 this was a great lesson for me about the power of prayer. the importance of listening to and acting on promptings from the Holy Ghost. And the ability a small act of kindness has to share God’s love with us. p.s. the other kindness today was michele grow, my first counselor in primary, offered to pick up some natural immune boosters for me at the store. i knew it wasn’t exactly on her way, but i was so grateful. she brought cranberry and elderberry syrup and lobelia herb for coughs. plus, i had joked with her earlier that you couldn’t go to the vitamin shoppe without sneaking by Nothing bundt cakes since they were nearby. She brought a delicious raspberry white chocolate cake. So kind. There are good people in the world and I hope to be better by sharing God’s love with others through service. https://www.jimmyandheather.com/wp-content/uploads/2013/10/200-x-100-logo.jpg 0 0 Heather https://www.jimmyandheather.com/wp-content/uploads/2013/10/200-x-100-logo.jpg Heather2016-02-16 22:44:542016-02-16 22:44:54"This soup is a Gift from God"
Truman’s teacher at school wanted us to have him tested for gifted and talented because she saw higher-order thinking processes in him. Tru’s teacher helped me understand this with a simple example of her son. Ms. Holley had expected someone his age to respond with, “The firemen better come quick.” or something like that. I’m still understanding what this means, but I think it’s super interesting. Sometimes Truman comes up with things that are fascinating to me. Things he calculates at his age. And questions he comes up with. Last year – age 5 – Truman was waking up too early. He came in and we told him he couldn’t watch tv until 7. I had this wild feeling that this was extraordinary for his age. Probably because I have to think and process 60-37=23 to figure it out. But his mind computes it so quickly, like it’s natural. Today Truman – age 6 – was begging me to buy a membership to Club Penguin. I told him that if he wanted it, we could buy a 1-month membership on his birthday. I told him since it’s February, his birthday is in 8 months. 5 minutes later, he came downstairs and said that his birthday was in 240 days. I asked him how he figured that out. He said he counted on his fingers by 30s. Way to think outside the box. Anyhoo… I just wanted to note Truman’s way of thinking. I wonder if many of his behavioral hard times are because he’s bored. He doesn’t think or focus the way I do, so perhaps he needs different stimulus and education. But look at how things turned out! So Cheerful and Christmasy. Our tree is slightly bare because I did toss some decorations in our move. But it is simple and personal. I love the LIGHT of Christmas. The peace from Jesus Christ. The JOY and cheer that abound. The calm, quiet moments with family. https://www.jimmyandheather.com/wp-content/uploads/2013/10/200-x-100-logo.jpg 0 0 Heather https://www.jimmyandheather.com/wp-content/uploads/2013/10/200-x-100-logo.jpg Heather2015-12-06 22:34:112018-08-30 09:08:18Let the Christmas Season begin! We love the duck pond by our apartment. It’s so lovely. It’s a great walk and a mellow family activity (well… as mellow as things get around which actually isn’t very mellow). But it’s a pleasant atmosphere. Autumn leaves falling! It’s arrived. The weather is perfectly lovely. And we’re enjoying it since we know summer at 110° might be a hard season. We’ve had plenty of rain over the past month which I guess has been welcomed by the people of Dallas as they had a dry summer. I don’t love driving in the pouring rain on The President George Bush Turnpike (yes, that’s the name posted everywhere… so long!). My anxiety picks up after those long drives especially if kiddos are restless and fighting. Our Utah home was supposed to close Last Monday but for some reason it was delayed … paperwork-smaperwork. But everything closed properly and we received the $ from the sale. Wahoo! The unfortunate thing is that I was disappointed that the buyers weren’t a darling little family who would add joys and laughter and friendship to Oak Crest. But perhaps the Spirit of our home and the love of neighbors will touch these men in a positive way. Oak Crest will be so quiet without our noisy family. The Lakes and Condies will have to carry on and make more noise to make up for us being gone… And seriously… I’m still so grateful for the quick sale of our home. What a blessing for our family. I guess there is good that comes of it all. Let’s see – what else. Hannah is doing great at violin. She has been allowed out of seclusion (sounds horrible… but really she had private lessons to catch up to the rest of the class). She’s musically inclined and catches on fast. Love that! She did a fund-raiser for their end-of-school-year field trip. Best school news of the week is that Hannah made the basketball team. She missed the first day of tryouts because we went to Houston for Patricia’s funeral. The 2nd and 3rd days she missed because she had the nasty stomach bug from me and scotty. The school secretary helped us get in touch with the coach who was willing to have her come Friday during Girl’s Athletics… and then allowed her to use the first few days of practice as her tryouts. Coach Lee let her know on Thursday that she was on the team. Wahoo. She likes many of the girls and a few girls from the ward are on the team. Also this week, Abe joined the Chess Club at school. A new friend, Jake, is also on the chess club. Abe said he’s a nice kid who seems respectful (a rarity for 11-year-old boys apparently). He’s excited to be involved in something and make more friends. He has had some interesting introductions to many types of people. He met a boy who is an atheist and thus we’ve had many conversations about religions and sharing personal testimony about what you believe. Max is enjoying having a friend Jackson from the ward who is in his grade. He was able to go play at his house. He was so excited to play some football. Though he jammed his finger which was quite a big deal to him. We told him it was a good experience for him to deal with that. Our friends the Binns have been so kind and welcoming and helpful. Liza thinks Annie is her only friend, though she is Truman’s age. I’m grateful for Amy who has answered all my annoying ‘new person’ questions. Plus, she is nice to sit by me in Relief Society. Eliza asks all the time if she can play with a friend. It’s sad to tell her we don’t have any friends yet and maybe when we move into our home, we can meet some new people her age. But I am doing preschool with her at home. 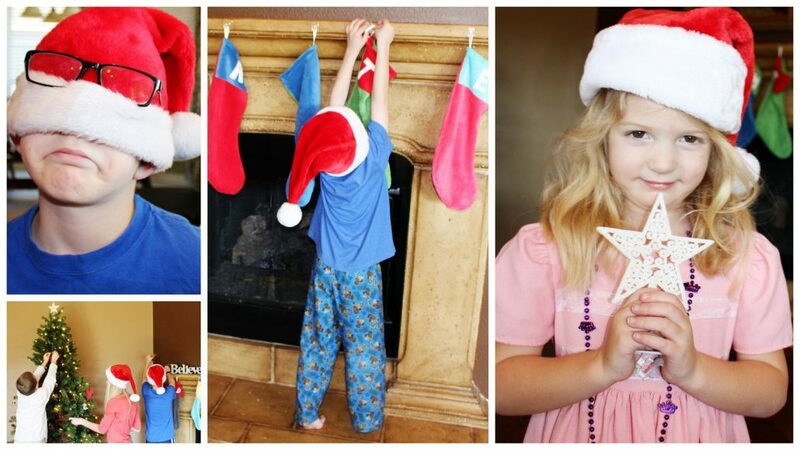 We use The Moffatt Girls downloads that are so cute. Eliza mostly loves to paint. But she practices her letters and especially her name. I was proud of myself for letting her use scissors. That’s a big deal around here! She also has loved having the Disney Channel in our apartment which is new for our family. The kids are into PJ-Masks and Miles. Liza always loves Sophia the First and the Mickey Mouse Clubhouse. She still gets on Youtube to find Peppa Pig though. haha. That peppa pig and her ice lollies and swim costumes. Ok – I’ll stop with our daily random news. 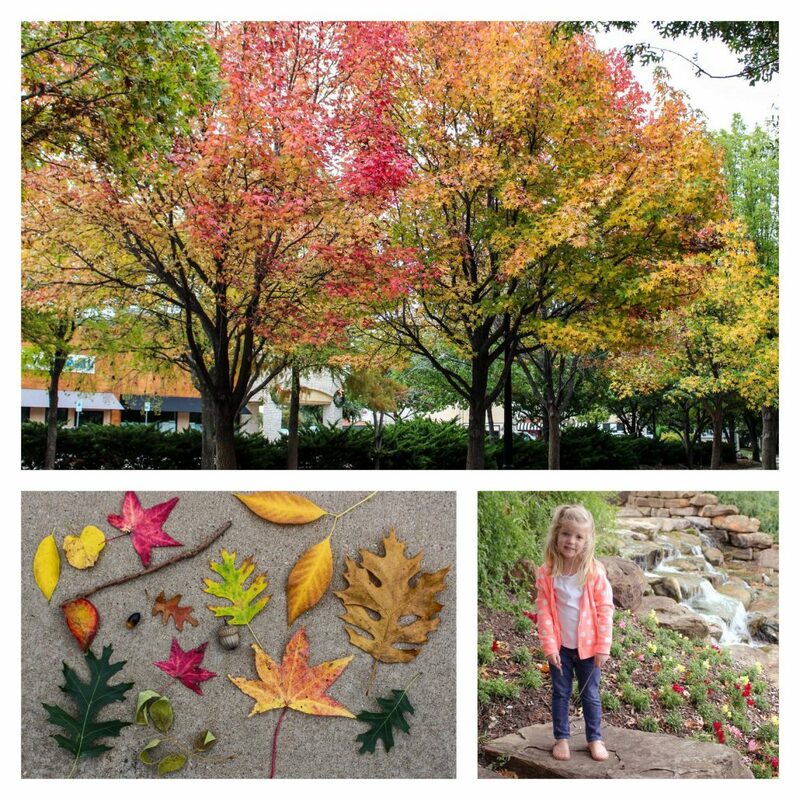 But as evidenced in the photos… isn’t it lovely here in Plano!